THE MOTHER OF ALL CONSPIRACIES OR THE TERRIBLE TRUTH?! I bring this information to the public with a very heavy heart. Some journalists revel in being able to expose the type of dramatic conspiracy contained in this article. I take no such pleasure in bringing this to your attention. I will receive no awards or accolades, nor do I seek any. I am setting myself up to be criticized as “one of those conspiracy theorists” with too much time on his hands who has nothing better to do with my time than to invent wild tales of corruption in an attempt to draw attention to myself. I will not be invited on Coast to Coast AM, to reveal my findings to an audience of 12 million people. Perhaps, 10-20 thousand people will actually take the time to read the stunning facts contained in the following paragraphs. What I am trying to accomplish is to start a chain reaction that will culminate in waking up a majority of the public in order to rise up against the abject evil that runs our country. This article is controversial, and I might not actually believe it myself except that every fact in this article is true. This article is structured in such a way that if the reader takes the time to follow the evidence trail, there can only be one conclusion that makes any sense. Prominent globalists are attempting to buy up as much water as possible to exacerbate the destruction of water resources in the aforementioned areas. In other words, Americans are looking at extreme water scarcity from which the globalists can wage wars and force submission to their will, while at the same time carry out their stated depopulation agenda. My instincts tell me that this conspiracy has more breadth and depth than what is revealed here and it is my sincere hope that my fellow researchers will afford some much needed attention to these issues, because I strongly believe there is more to learn and we do not have much time because humanity’s fate hangs in the balance. The Obama administration and many others (individual billionaires, select politicians, BP, Exxon, Nalco, GM, GE, Goldman Sachs, University of Chicago, and many others including the Department of Defense) are all deeply invested in bio-fuels. These billionaire psychopaths will willingly sacrifice the Gulf and all of its residents for this multi Trillion Dollar industry representing a new era of energy applications. Nitrogen fertilizers and Corexit are being used to systematically create dead zones in large bodies of water in the United States. The use of nitrogen fertilizers and Corexit are accomplishing the same result. This is no coincidence, as the tragedy in the Gulf was perpetrated to accomplish this end. Farmers apply nitrogen fertilizer to crops to increase yield. Farmers are compensated by the government for crop yield. Therefore, farmers overload the soil. Plants absorb only 30 to 50% of the nitrogen, so as much as 70%, or 87 pounds per acre will end up running off into the nearest body of water. The only thing that grows in this environment is algae. Therefore, nitrogen has a decided evil side as it is creating huge problems with major bodies of water that we are only now beginning to understand. The EPA is aware of the problem, yet remains silent on the issue. Chesapeake Bay is polluted beyond repair in which massive fish kills, general habitat degradation and bacteria proliferation threatens the health of humans. The damage is rampant. This massive pollution, resulting from the nitrogen runoffs resulting from agricultural endeavors, fills the Chesapeake Bay and, again, the only substance which flourishes in the bay is algae. 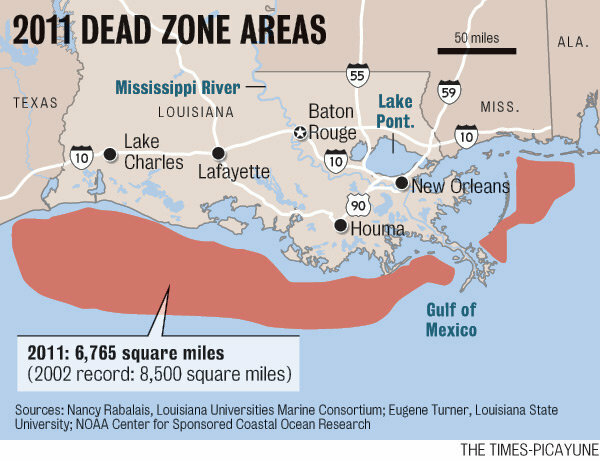 Each and every spring, excess fertilizer is deposited into the Mississippi River which eventually ends up in the Gulf of Mexico, thus causing a massive algae bloom that leads to a giant oxygen-deprived “dead zone” where fish can’t survive. And the same thing is going on in the Great Lakes in places like Lake Erie. Following the Gulf oil spill, and against all common sense, the most lethal form of dispersant, Corexit, was used to treat the oil spill. Instead, what happened is that the spill has resulted in the creation of the second largest dead zone body of water in the world; second only to the Baltic Sea. And, as the reader will discover later in this article, the new energy craze among the so-called environmentalists is algae. Once one understands that Algae proliferates in an otherwise dead zone of water, then one will understand why Corexit was used in the Gulf. And when one understands that fact, one can only conclude that Gulf oil spill was not an accident as it marks the ushering in of a new era in which the bio-fuel, algae, will replace oil. And, amazingly, the oil companies are among those who are behind this plot to destroy major bodies of water in order to allow for the propagation of algae. President Obama is also participating in this conspiracy against humanity. On March 15, 2013, President Obama announced that it is his intention to move American vehicles away from oil to bio-fuels. Obama, amazingly in this period of Sequestration, has asked Congress for two billion dollars to expand research in this area. And isn’t it an interesting coincidence that the President’s science advisor,John Holdren, in 2009, advocated for “fertilizing” the oceans? I remember that most people thought Holdren had lost his mind when he proposed this as a solution for global warming. However, in the context of creating dead zones through the use of Corexit and nitrogen fertilizers, his suggestion makes a great deal of sense in light of today’s heightened interest in bio-fuels. This cannot be described as anything but psychopathic thinking in that the EPA would allow nitrogen fertilizers to destroy major bodies of water in which only algae can grow. And that this administration would even entertain the idea of creating oceanic dead zones through fertilizing these bodies of water is nothing but pure insanity. It is dangerous to the entire well-being of the planet. But of course, we are dealing with psychopaths. How many brush fires equals an all-out forest fire? How many coincidences does it take to make a conspiracy? For those who think that there are some interesting thoughts presented here, but the conspiracy angle of destroying major bodies of water to foster the growth of algae needs more proof, let’s take a look at a variable which will connect all the dots. I began to realize that many of our major bodies of water were being destroyed and all that was necessary to reverse the destruction was to halt the use of nitrogen fertilizers. Then I discovered that Corexit creates the same kind of dead zones just like nitrogen which also was unnecessary in its use because a less virulent dispersant could have been used in the Gulf. Did you know that Corexit is banned in 19 countries? It was at that moment that the light went on for me as I realized that we were witnessing the systematic destruction of major bodies of water on a grand scale. This was coupled with my discovery that the oil companies appear to be preparing to transition from oil to algae. BP is not alone with regard to a major oil company’s foray into the algae business. ExxonMobil entered into a partnership with Synthetic Genomics in order to develop energy’s next king, bio-fuels from algae. From this work, it was discovered that Corexit increases the bioaccumulation of petroleum hydrocarbons into golden-brown algae. For oil companies to be involved in algae conversion is the metaphorical equivalent of burning down your own house in order to collect the insurance money, and this is precisely what they did to the Gulf. The major problem with using algae as the next bio-fuel is that the fuel yields from algae are still too low for it to be a break-even proposition. However, if that problem were to be solved, algae would be king because it is such a low-maintenance substance. In a related and stunning development, Exxon has partnered with Craig Venter, the pioneer of DNA research. Venter has a stellar record of achievement in his work on the human genome. If anyone can solve the algae yield problem, Venter would the guy. However, if Venter cannot solve the problem of algae yield, OriginOil, Inc. is developing a novel technology which will transform algae into a source of renewable oil. Below is a depiction of the process. Readers need to keep in mind, that Exxon and BP began moving into the algae business several months prior to the Gulf oil spill and BP and its partners have been caught pre-positioning their stock moves to maximize profits and minimize losses IN ADVANCE of the oil spill event. And now they are leading the way to convert the nation from oil to algae energy use. These twin giant oil companies have had a lot of help in making this massive conversion a reality. George Soros is involved in “clean energy conversion” away from oil. Readers may recall from Part Six of this series proved that Soros financial interests were among the top five of financial institution which dumped BP stock a few short weeks before the oil spill, thus, making him a co-conspirator. And now Soros is heavily invested in Gulf algae farms as he has invested $1 billion dollars in the endeavor. T. Boone Pickens is well on his way to controlling the vast Ogallala Aquifer. Pat Stryker and Koch brothers are involved in garnering Colorado’s water resources in the beta test battleground for Agenda 21. Did you know that that it is illegal in Colorado to reuse irrigation water and to catch rain water? We should be asking ourselves why. Additionally, the Bush family controls the biggest water aquifer in South America. Meanwhile, the globalists are destroying vast amounts water resources in the United States. It seems that the globalists are hell-bent on creating water scarcity. I do not believe that the globalists only motive is to destroy the Gulf and fresh water supplies so that their new biofuel craze can take hold. I think this is a byproduct to what the central planners are truly after, control over all water which will result in control over who lives and dies. This and more will be covered in the next installment of the Great Gulf Coast Holocaust.